RCMP Cpl. 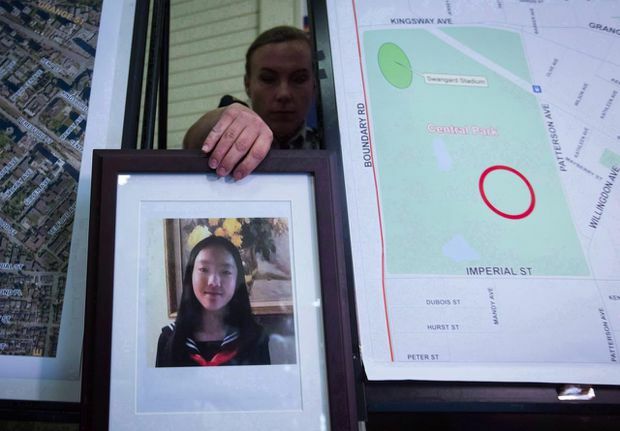 Daniela Panesar places a photo of Marrisa Shen, 13, next to a map indicating where her body was found in Burnaby’s Central Park in July, 2017. The family of a 13-year-old girl whose body was found in a B.C. park say they hope she can finally be at peace now that police have made an arrest, bringing a sudden close to an investigation in which officers recently admitted they did not have a suspect. The arrest in the killing of Marrisa Shen was announced at a news conference on Monday. The teen’s body was found in Burnaby’s Central Park in July, 2017, and her death stunned and frightened members of the community. In response to questions about the suspect, police said the man charged with first-degree murder in Marrisa’s death arrived in Canada last year as a Syrian refugee. The officer overseeing the investigation described the case as isolated, and said it should not reflect on others, a position echoed by refugee advocates. Marrisa’s family, in a statement released through police, thanked officers and the public for their support. “We hope that justice will now be served and that Marrisa can finally be at peace in heaven,” the family wrote. After Marrisa’s death, police released surveillance video of the teen in her final hours and asked people who had been near the park to turn over any footage they had. In addition to identifying more than 2,000 persons of interest, police reviewed more than 1,000 hours of video from 60 locations. The case would become one of the Integrated Homicide Investigation Team’s largest since it formed in 2003. At a news conference marking the one-year anniversary of Marrisa’s death this past July, an arrest did not appear close. The investigation team said it did not have any suspects and issued another plea for information. Superintendent Donna Richardson, the officer in charge of the Integrated Homicide Investigation Team, said on Monday the man charged in the case came to the police’s attention about two weeks ago. She said the man, Ibrahim Ali, had not been known to police and did not have a criminal record. She would not disclose what led investigators to Mr. Ali because the matter is before the courts. Supt. Richardson said Mr. Ali, a permanent resident of Canada, is employed and has family in this country, but could not provide any other details. He will make his next court appearance on Friday. Mr. Ali, 28, was arrested last Friday in Burnaby. Superintendent Deanne Burleigh, the officer in charge of the RCMP’s Burnaby detachment, joined Supt. Richardson at the news conference and said the death of Marrisa had led residents to fear for their safety. “Marrisa’s murder shook our community,” Supt. Burleigh said. Derek Corrigan, Burnaby’s mayor, in a statement thanked police for their hard work and expressed his deepest sympathy to Marrisa’s family and friends. Supt. Richardson said police believe Marrisa and Mr. Ali did not know each other and the attack was random. She said she could not discuss a motive or evidence. Supt. Richardson said Mr. Ali had been living in Burnaby for about 17 months. She said he had previously lived in Syria and arrived here as a refugee. When asked if she was concerned about a public backlash against other refugees, Supt. Richardson said she hoped that would not be the case. “By and large, our refugees that come to the country are hard-working citizens that are very happy to be in Canada. I would just hope that we look at this incident for what it is, and it’s a one-off situation,” she said. The Immigrant Services Society of B.C., which assists refugees, in a statement said it shares the public’s and the family’s desire for justice for Marrisa. “At the same time, we wish to caution the public against stigmatizing an entire ethnic community for the alleged criminal act of one individual from that community,” the statement read. Immigration, Refugees and Citizenship Canada in a statement offered its condolences to Marrisa's family. It said it cannot comment on cases before the courts, but each refugee Canada welcomes "undergoes a robust, multi-layered screening." It said 57,815 Syrian refugees were admitted to Canada between November, 2015, and July, 2018. RCMP investigating suspicious death of teen in Burnaby, B.C. RCMP investigating suspicious death of girl, 13, in Burnaby, B.C.